I started the the Knights of Nerdvana shortly after my time on King of the Nerds. At first I started to interact with fans of the show through the #NerdArmy. I teamed up with a small group of dedicated fans that quickly became friends and we worked together to use social media to campaign for a 3rd season of King of the Nerds. I mobilized fans to support a 3rd season by daily posts using the hashtag and creating movie poster parodies that reflected our nerdy interests. I also started to host weekly Google hangouts called #NerdArmy Briefings to update the fans on the casting news and updates on our endeavors. After the show was picked up for another season I was attached to my crew of nerdy pals and felt that I was in a position where I could give back to everyone. I decided to build the site and continue the #NerdArmy on social media. Not as a way to promote myself, but as a way offer a place for people to feel like they were a part of something. They can join like minded nerds around the virtual round table. In order to build the site I teamed up with nerds from throughout the nerd kingdom and called on their expertise and experience. 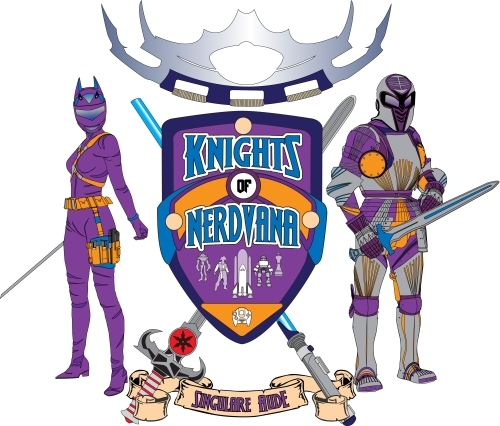 Together we created the Knights of Nerdvana with the goal of providing a needed service to their fellow nerds: a haven that would welcome nerds of all fandoms and allow them to nerd out and share their passions. I continue to host weekly hangouts, we select a young nerd every month to be our Squire of the Month. We have nerds who want to try their hand at podcasting and blogging and I use my site as a platform for them to give it a try and to contribute to site. I use the KON site to try new forms social media support for the site and even expand my own knowledge of the nerd world with our monthly Round Table Challenges. We are the Knights of Nerdvana and this is our kingdom. We represent all things nerdy and wish to provide a safe and friendly environment for our fellow nerds to gather and express their fandoms. As the Knights of Nerdvana, we will protect this kingdom of nerd culture and allow for all fandoms to be treated equal. We welcome all nerds to join the cause, team up with our #NerdArmy, and carry their nerd banner proudly. So come on in and join the Knights of Nerdvana today. Represent your Nerd! Whether you hail from Vulcan, Azeroth, Gallifrey, or Persephone, you are welcome here. For we are nerds. And we are many! "Get Your Nerdy Know-How With The Knights of Nerdvana"